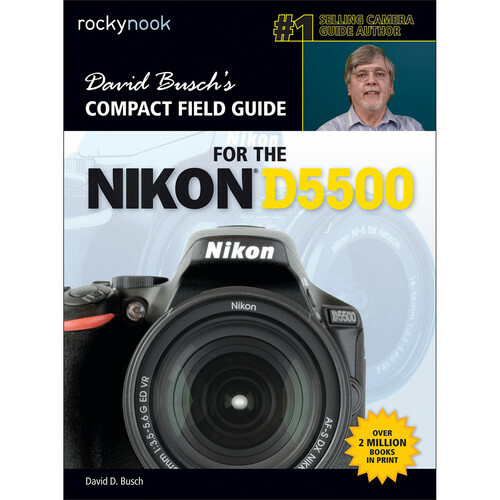 David Busch's Compact Field Guide for the Nikon D5500 from Rocky Nook takes essential reference information on the D5500 and condenses it into a handy-sized text that can be tucked into a camera bag and carried anywhere. Filled with detailed how-to steps and full-color illustrations, this guide covers all the camera features, including advanced setup, exposure, use of electronic flash, and more. The handy visual guide has close-up photos and descriptions of essential features and controls, accompanied by the author's recommended settings for every menu setting. Also covered is the camera's updated autofocus system and how to use its Wi-Fi and Near Field Communication (NFC) system to link the camera to your computer as well as an iOS or Android smart device. The versatile, swiveling, touch-sensitive LCD screen is explained as well, and David shows you the basics for shooting HD video with stereo sound. From quick setup advice to detailed explanations of the most advanced features, this guide will quickly and easily show you how to get great results with your camera.